• Is Donald Trump America’s savior or a plutocratic shill? Is billionaire Republican presidential candidate Donald John Trump a man of the people worth endorsing, or is he playing a part in a carefully crafted script that seeks to keep the tens of thousands of angry grassroots Republicans, who are fed up with the way Washington has been doing business, from bolting the Grand Old Party? Since the Republican presidential primary season kicked off earlier this year, Trump has dominated the race. In poll after poll, no other Republican contender comes close to Trump. Even former Florida Governor John Ellis “Jeb” Bush, who most people suspected was going to be crowned the 2016 Republican presidential candidate, trails Trump by a sizable margin in New Hampshire and Iowa. A survey of registered Republicans in New Hampshire taken on August 25 shows Trump in the lead at 35% in that state’s upcoming primary. His closest competition is Ohio Governor John Richard Kasich, who is polling at a paltry 11%. To be fair, Trump’s popularity comes not just from being a sort of anti-politician in a sea of manicured, coiffed and finely polished professionals. In every speech and interview he gives, Trump affirms his independence from Washington, casting himself as a confident and successful business executive—an embodiment of the American dream—who’s not afraid to speak his mind about the terrible troubles facing this country and draw the wrath of well-funded lobbying groups. When it comes to the planks in his platform, much like the other candidates in the Republican primary, Trump argues that the federal government is too big. He wants to kill Obamacare, is pro-life and is opposed to homosexual marriage. And when it comes to the country’s energy needs, he contends that the United States should drill for oil in the U.S. and get off of foreign crude. He’s also tough on crime and supports the death penalty. But where he differs is a key distinction that has set him apart from the free-trading fanatics who currently dominate U.S. trade policy and has drawn the attention of the editors and reporters at this newspaper. In several speeches over the course of the past few months, Trump has stated that the U.S. needs to “renegotiate” free trade. When he officially announced his candidacy on June 16, he said the world views American trade officials as “saps,” who give up the store to foreign countries. Trump says if he is elected president he will immediately enact a 20% tariff on all U.S. imports at the water’s edge to protect struggling American industries. He would ban so-called soft money—the billions of dollars in campaign funds that are handed out to politicians every year but need not be disclosed to the American people. But where Trump has really been drawing support from Republican faithfuls has been his outspoken stance on immigration—views that have earned him the ire of liberal journalists and special interest groups around the world. Right from the beginning Trump came out swinging on illegal immigration. In his official announcement speech, he argued for building a 2,000-mile-long, triple-layered wall on the U.S.’s southern border, and then he said he wants to send the bill for its construction to Mexico. All illegal immigrants should be peacefully rounded up and deported, he added. Finally, he said, overall immigration to the U.S. should be limited until joblessness and poverty are addressed in this country. We’ll be watching Trump very closely in the months ahead as he continues to lay out his plan for the nation before the country’s first primary in New Hampshire on February 9, 2016. Until then, the question remains, does Trump deserve AMERICAN FREE PRESS’s endorsement? Let us hear from you on this topic. 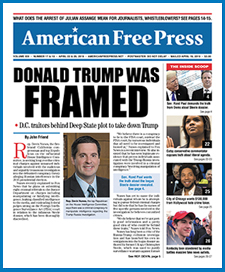 Christopher J. Petherick is AMERICAN FREE PRESS’s executive editor. 8 Comments on People’s Billionaire? Trump has a very different personality than the other Republican born with a silver spoon in his mouth, but, if you are born to inherit billions and grow up to be a billionaire, is that REALLY an American success story? If he were elected President he would no doubt, much like the brain dead President Bush, Jr., be surrounded by a professional team of foreign policy advisers like the Bush VULCAN team headed by Condoleeza Rice and quasi-Nazi/Zionist network of neo-conservatives who gave us 911. What inspired this man to run for President? Probably received a microwave message from the Central Command of our Mind Control System and thought he heard the voice of God! Funny how in first debate when questioned if God influenced their life, the only two candidates answered and we did not hear from Donald. In my opinion, much like Netanyahu, I believe Trump now believes he is a Man of Destiny. I will check out what he did with his daughter. Donald Trump make America great again? I cant wait for a good cartoonist to give us a picture of that idea! Bravo Donald. So far so good. MAKE AMERICA GREAT AGAIN is more than a motto to Donald John Trump. For one thing, The Donald comes from a business family. His dad was very successful and he seemingly passed this success to his son, Donald John. His first book that went viral was The Art of the Deal.” Much of what he talks about today is what he wrote about many years ago. This clearly shows that he stays strong in his belief about his ability to pull off making America great again. The formula for this to some degree is found in The Art of the Deal. The world is in turmoil nearly everywhere. And I believe that TRUMP can and will become President and turn the tide not only for our good old USA but for other countries as well when they see how America can bounce back with someone as President who will work day and night to Make America Great Again. Trump’s a Zionist who has pimped his own daughter/son off to the Synagogue of Satan Khazar Zionists! See (REALJEWNEWS) for more info! The tack Trump has taken is not one easily noticed by the rich, the slow death of America as the 1% show no sign of a slowing greed. For this reason I think he is different than any living rat publican. How he came to realize this would be interesting to know. I have yet to meet a man who is a billionaire and a real Christian trying to follow the doctrines of Christ. How many poor people would someone have to trample on to get those billions? Wake up people. The U.S. election process is a rigged game. The face changes but the boss remains the same. It’s a “dog and pony show” meant to distract. The federal government is an illegal corporation, the president is the CEO who takes orders from the board of directors and that’s not the American people. There is no real election; the president is chosen by the board. They do the will of the corporations, bankers, foreign bankers who control the Federal Reserve. No “election” is going to change much for the people. The system is too corrupt. Only something like a NESARA LAW will effect change. A real national economic and restoration act. Otherwise it’s the same old soup just warmed over. TRUMPS U.S./MEXICAN BORDER WALL IS—ONLY—TO BE EFFECTIVE, IF ADJOINED WITH MANDATED E-VERIFY? Whatever way the story ends relating to modifying the 14 Amendment, the birthright citizenship edict in the U.S. Constitution and the ‘Anchor Baby’ interpretation is yet to come. The American people who want something done about the illegal alien invasion that has a huge negative financial effect on U.S. citizens and lawful residents; but not on business owners? Trump building the wall is just the first step, which will end to some degree the invaders, such as families, with children but it will not halt the single men who prepare the way for the whole family in most cases to cross the border. However, by installing MANDATORY E-VERIFY in every work place will end the access of employment to foreign labor. To make it work it must bear harsh fines, suspension of business licenses and statutory federal prison for 5 years. No exemptions for either Democrats or Republicans, for their friends and cronies. Don’t rely on the U.S. government to ever tell the truth about illegal immigration. To believe in the numbers of foreign invaders squatting here, is nothing but folly. Their numbers I would suggest are generated from the last Census and other limited calculations. If they are saying that California on its own has population legal and illegal foreigners, which have overtaken the Caucasians, then the figures cannot be correct. Officials say as of last March Latinos will make up 39% of California’s population, edging out non-Hispanic whites at 38.8%. Nearly 25 years ago, non-Hispanic whites made up 57% of the state, while Latinos made up 26%. There is no way the numbers of Hispanics proposed are ALL here legally. But whether you’re a natural born citizen, a naturalized citizen or a legal resident of any race, religion or creed you have nothing to fear from ICE. The leftist presses are very good at intermingling the term illegal alien with lawful resident and this is far from the truth. This is truly an invasion and the only way to end this administration travesty is to mandate E-Verify that every U.S. employer must be held liable. Currently it’s a big mix of state laws, but no central control from the (ICE) U.S. Immigration and Custom Enforcement. Stating there are only 11.4 million illegal aliens in the U.S. doesn’t hold water; it’s just a way for both political parties to continue the charade. Republicans want as many foreigners in the country to cut wages and use cheap labor. Democrats and the radicals want a claim as many illegal aliens to use them for illegal voting; don’t say it doesn’t happen? Read under “Voter Fraud.’ Nor is it just for local elections, as it happens in the state and general elections. IF, and I say if the Congress turned aside the money offered to them by special interests, then just perhaps the American people have a say in their future. To vote on a bill or load up votes to get a really bad bill to pass and then signed by any President is the corruption that runs like slime through Washington. Donald Trump said so and has been approached by the same lobbyists; probably a previously departed lawmaker who already knows the senators and representatives who can be bought. The buyers of political votes have always been there, but today it’s more predominant as more and more money is needed for political campaigns. It’s like a stealth jet fighter that it’s there but it’s hard to see it. Large sums of money change hands, much of it designated for the political war chest, but not all of it. To reiterate, the more corrupt politicians move thousands of dollars to private accounts.